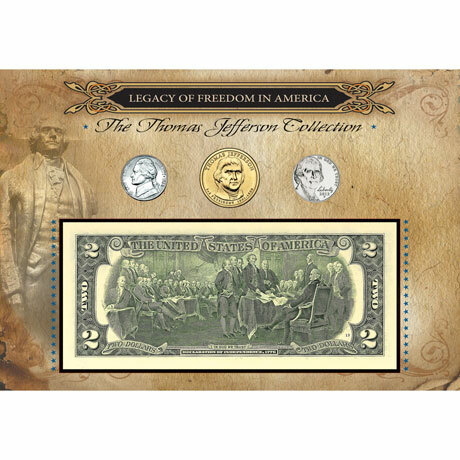 A collectible tribute to one of the United States great leaders, Thomas Jefferson, is housed in the Legacy of Freedom in America. The set honoring the President and founding father includes a Jefferson Monticello Nickel, a Jefferson Presidential Dollar Coin, the new face of Jefferson Nickel first minted in 2006 and a $2 bill showing the signing of the Declaration of Independence. A Certificate of Authenticity is included. Allow 2-3 weeks for delivery. No rush delivery or gift box. Item can only be shipped within the Continental US.